The holiday season and new year is the perfect time to pause and reflect on everything for which we have to be thankful. We have the opportunity to be surrounded by loved ones and enjoy time and fellowship with one another. The Lord has truly blessed us all with so much and given us the perfect gift; Jesus, who offers us a true and deep sense of peace and contentment. Peace and contentment can rise up in us through nature, or music or kind people. If we recognize these things as blessings it only takes a moment to accept his invitation to receive them and allow them to nurture us. During this time, it can be so easy to get caught up with the busyness of traveling, buying gifts, and attending holiday gatherings; we can quickly lose sight of the true meaning of the Christmas season. 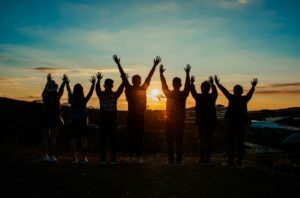 When our focus is centralized on things we may not have, such as material items, a significant other, the perfect decorations or event schedules, our vision can be clouded of everything we do have. The craving and striving that cause discontent will feed feelings of disappointment and can cause us to feel abandoned and forgotten. Feeding this seed of discontentment will only create a deep and relentless hunger that can never be satisfied. Shifting our focus to gratefulness definitely takes practice and a conscious effort. Try a personal test: one day, practice your grateful muscle by putting effort into noticing every blessing throughout the day – driving your car to work, meeting a friend for lunch, putting your coat on when you walk outside, receiving a smile from a stranger. It does take time and practice; but by being intentional, we can develop a more positive, grateful outlook. It starts with being grateful for what we do have in the present moment. All of the sudden something like “being able to breathe on your own” becomes very valuable. Our prayer for you is that this season you will be surrounded by love and filled with joy! Blessings from our families to yours. Like many of you I was overcome with joy when I heard the news that the young Thai soccer players and their coach were rescued from being trapped in a cave. Their environment was becoming more and more hazardous for their health, and their chances for being rescued were getting smaller by the hour. The situation was so dangerous for the boys and the divers that one expert diver died when he ran out of oxygen on his way out of the cave. Their rescue was meticulously planned and executed. Expert divers prepared the players for the harrowing journey out, they were surrounded by the divers as they swam out of the cave, they were given medicine to calm them and a rope to guide them. I can relate to aspects of this scenario, can you? Maybe we find our lives “flipped” from following our own curiosity that has led us deep into a dark cave where we become trapped. Maybe our circumstances are so scary that we are required to dive deep into the unknown and trust when we can’t see ahead; finding that we neither have the strength nor the ability to solve our own problems. Even writing this blog is one of those scenarios for me, not life- threatening mind you, but scary nonetheless. Putting my thoughts out to the public knowing I am neither a writer by training nor an expert on scripture creates apprehension in me. However, I choose to act because my faith experience has shown me that I am not alone, I have an expert rescuer guiding me. This expert is available to all of us. This expert is God, Jesus the son, was willing to give His own life to save ours. God, the Holy Spirit, who builds our trust by encouraging us, teaching and preparing us, and calming us. God, the father, nourishes us with food and oxygen, hems us in so that we feel secure, gives us a rope (scripture, family, community) to hang onto; and then leads the way out or through our circumstances. Furthermore, we have access to God, through Jesus and the Holy Spirit, at all times and in all places. He will never leave and go home. God will not make us follow Him, He knows that it is crucial that it is our choice to believe in Him. It is our choice to surrender to Him, and to trust and to follow Him. All humans struggle with this choice to surrender, trust and follow. We are by nature “strong willed” because we want to be in control. 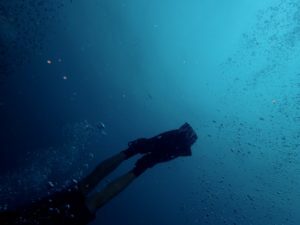 It is scary to literally put our lives into another person’s hands, because we know human experts are limited, as we saw with the expert diver who was overcome by his natural limitations. Perhaps we have experienced authority figures who were not gentle, patient, or forgiving. But what if we put our trust in a God who knows us intimately, who, if we choose Him, will forgive our weaknesses and strengthen us? An all knowing eternal expert, triune God, who desires for us to accept Him so we can live with Him forever once our natural limits are reached on this earth. Faith takes practice and discipline, and many times my “strong will” gets in the way of experiencing His influence in my life. However, when I do choose to surrender to Him, trust Him and follow His direction the result is that I am less likely to feel anxious or sad. His faithful provision gives me hope that He will continue to do so in the future, encouraging friends help me to see that what I am going through, with His help, benefits others and strengthens me. Furthermore, His comfort through scripture and prayer provides relief from the false notion that I have to rely totally on myself or other limited human beings. It does not take a crisis in our lives to bring us to the point of choosing to lay down our will to follow God’s will for us. He wants us to know Him so we can begin to see that He is loving and trustworthy, no matter our circumstances past, present and future. He does not promise that following Him will be easy, but He does promise that we will never be alone. Even if our vision is limited and we can’t feel him; He will give us a rope and He is on the other end, leading us to eternal life with Him. First of all, we want to welcome you! We are Tommy and Robyn Van Zandt and are co-founders of FlippedStory.com, along with our dear friend and brother-in-law Mark Saviers. Mark is the author of the new book Flipped, which tells our family’s story. We have a question to ask you: Have you ever experienced pain so intense that it flipped your world upside down? Pain that was physically, mentally, emotionally or spiritually paralyzing? Please know that you are among friends here. We’ve been there and, in some ways, are still in the midst of that battle. Our Flipped Story began in 2009 when Tommy was permanently paralyzed from the chest down in an accident. What he went through— what all our close friends and family went through—was what sometimes felt like unbearable agony, anger, depression, and a great sense of loss for lives that would forever be flipped from what we all knew. Through it all, God has been faithful. Through it all, God has provided solace. Through it all, God gave us hope. You are invited to join us on this journey as you pilot through your own Flipped Story. Just as we share on throughout this website, our prayer for you is that your Flipped Story become one of triumph over tragedy. That it becomes about courage, faith, and hope to live in the grace and joy of God. We believe this is possible through time, resources and, most importantly, finding solace in daily prayer and reflection. We created this site just for you to meet you where you are in your Flipped Story. We want to be clear in that we are not counselors and we do not have all the answers. But we want to be a source of encouragement and share what we’ve learned with others who are experiencing tragedy. Downloadable resources that will guide and encourage you through your journey. The road ahead of you will be difficult to be sure. But you have a faithful, loving God that aches to provide you refuge and strength through your Flipped Story. We are thankful for you! God is our refuge and strength, an ever-present help in trouble. Therefore, we will not fear, though the earth give way and the mountains fall into the heart of the sea.